The fact, that we didn't have a single piece of vegetable at home, made me go to our local market despite bad weather. Although it's summer, I can't count on weather as I live in London. I was originally going to buy vegetable, however as I saw those lovely strawberries - just £1 for two punnets, I couldn't leave them there. I knew instantly what I was going to use them for. 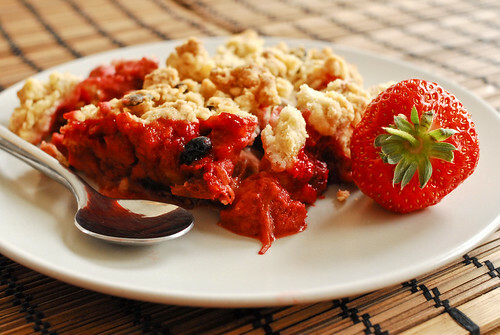 I've already had another two punnets of strawberries in the fridge from the last week, and the apple crumble was so delicious and it had such a great success... so why not to try a strawberry version? I think crumble became my favorite dessert, it's delightfully quick and easy to make and almost any fruit at home can be used. I like combination of strawberries and rhubarb but I didn't get any rhubarb at the market. Note: when I made Apple Crumble last time it was too sweet for us so I decided to use less sugar this time - about 150g and I reduced the butter in this recipe as well to 180g. Actually I replaced porridge oats with our breakfast muesli again - it was great success last time! 1 Preheat the oven to 180C/ 350F/ Gas 4. 2 Mix the flour, porridge oats and sugar in a bowl. Add the butter and rub between your fingers until it is the texture of breadcrumbs. You can serve the crumble with ice cream or custard. But I prefer it on it's own!